There is universal agreement among protozoologists working with Leishmania that the BALB/c mouse is especially susceptible to infection with these reticuloendothelial cell pathogens. A random survey of mouse strain distributions for susceptibility to different Leishmania species suggests that the BALB/c may be unique in this regard: it is the only reported strain that is susceptible to both cutaneous and visceral leishmaniases (Bradley 1977; DeTolla, Scott & Farrell 1981; Howard, Hale & Chan-Liew 1980; Perez, Arredondo & Gonzalez 1978). The genetics of innate resistance to one of the visceral leishmanias, L. donovani, has been analyzed in detail (Bradley, Taylor, Blackwell, Evans & Freeman 1979): early control of intrahepatic replication of the parasite is regulated in intravenously (iv) inoculated mice by a gene on chromosome 1, Lsh. 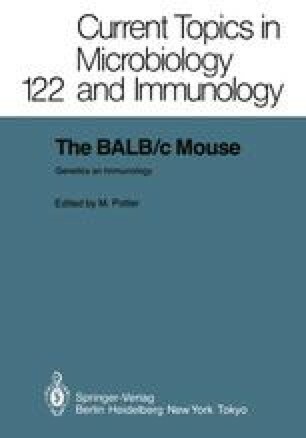 This gene, or a cluster of tightly linked genes, controls early resistance of mice to several distinctly different intracellular pathogens: Salmonella typhimurium (Plant & Glynn 1976; Taylor & O’Brien 1982;) Mycobacterium bovis (BCG) (Gros, Skamene & Forget 1981), M. lepraemurium (Skamene, Gros, Forget, Patel & Nesbitt 1984); and M. intracellulare (Goto, Nakamura, Takahashi & Tokunaga 1984); and L. donovani (Bradley et al. 1979).